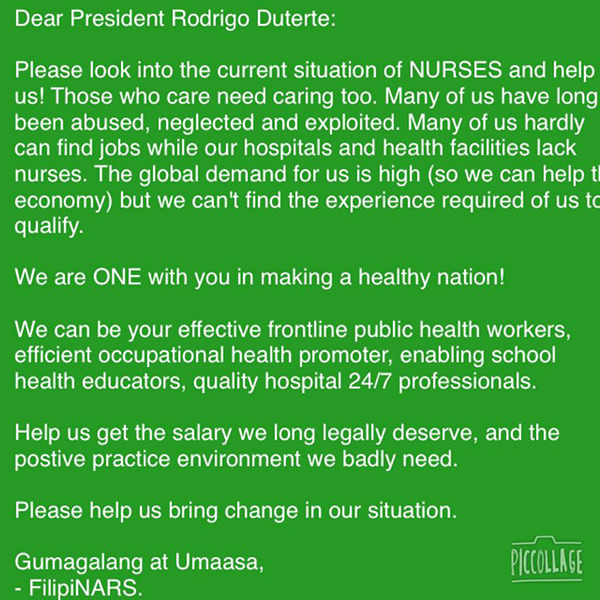 Filipino nurses, the backbone of the country's health care system, made an appeal to presumptive President Rodrigo Duterte in an open letter. In an inteview with Rappler in late October last year, the Davao City Mayor vowed to increase the salaries of teachers, police and military when he becomes president. In succeeding interviews, Duterte even said he would double their pay. Nurses were not mentioned and they felt left out. Majority of them are now appealing to the incoming president to help them get the salary they long legally deserve. 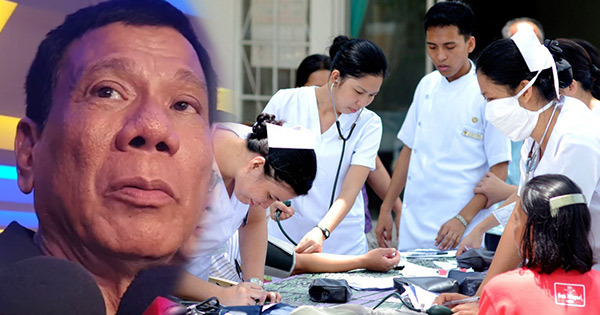 Dr. Carl Balita, radio anchor and businessman who is also known for his advocacies for the welfare of nurses, urged fellow nurses to share an open letter to Duterte via social media. "NURSES, our president-elect is listening, if we convey the message loud enough. LIKE and SHARE (dont just copy pic and dont create another one) to make this VIRAL for the world to know of our appeal," his caption reads. "Make some noise, nurses! Change is coming!" Aside from the open letter, Balita said he is also sending a letter to Duterte, but "social media can move mountains." As of 4 p.m. on Wednesday, May 18, the open letter received more than 4,000 likes and reactions and was shared nearly 3,000 times on Facebook. Senate Bill 2720 otherwise known as Comprehensive Nursing Law of 2015 was approved by the Senate on November 30, 2015. It was adopted by the House of Representatives on February 2, 2016. Among the provisions of the bill is the setting of the minimum base pay of Filipino nurses to Salary Grade 15 which is equivalent to P24,887 for public and private health institutions (Article VII Section 47). Once enacted, the law will repeal Republic Act 9173 or the Philippine Nursing Act of 2002. A house statement said it would restructure the scope and practice of nursing, ensure competitiveness, provide a better practice environment and strengthen the profession. Hence, the law would upgrade the country's nursing profession and address unemployment and misemployment of Filipino nurses. The measure was sent to Malacañang for President Benigno Aquino III's signature. However, the Department of Budget and Management (DBM) reportedly said it lacked funds to implement. Nurses are hopeful that the Comprehensive Nursing Law of 2015 will be enacted under the Duterte administration.